The latest report from the German Academic Exchange Service (DAAD) provides a detailed view of student mobility in and out of Germany. It shows that the country’s foreign enrolment is tracking well towards a longer-term goal to host 350,000 students by 2020, having grown by about 7% between 2013 and 2014. Outbound mobility, meanwhile, is increasing as well, albeit at a slower pace. 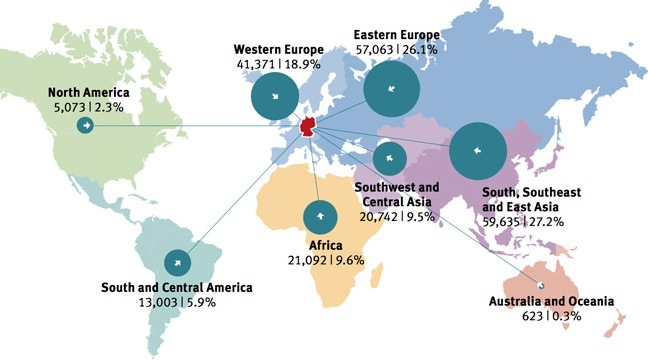 The 138,500 German students who studied abroad in 2012 represents a 1.4% increase over 2011. As we reported last year, the country’s growing enrolment base places Germany among the top study destinations in the world, after the US and UK certainly, but contending with China, France, and Australia for the number three rank among major global destinations. Students are drawn by Germany’s status as a leading world economy, but also by the modest tuition fees for international students as well as immigration policies that support the interests of a majority of students in staying and working in Germany after graduation. DAAD’s annual Wissenschaft weltoffen Kompakt report for 2015 (“Facts and Figures on the International Nature of Studies and Research in Germany”) reports on trends for two distinct categories of foreign higher education students: Bildungsinländer (“students of other nationalities who have obtained their higher education entrance qualification in Germany”) and Bildungsausländer (“students of other nationalities who have obtained their higher education entrance qualification outside Germany”). The distinction is interesting in that Bildungsinländer have a longer history in the country and have completed some preparatory studies in Germany before beginning their higher education programmes. Some of these students may be in the process of immigrating to Germany, or may have chosen to begin their studies in the country at an earlier point to improve their admissions prospects or their chance for success in more advanced studies. Bildungsausländer, on the other hand, complete their admissions requirements outside the country and come to Germany primarily to pursue higher education studies. As the following chart reflects, the Bildungsausländer group accounted for 72.6% of Germany’s foreign higher education enrolment in 2013/14. 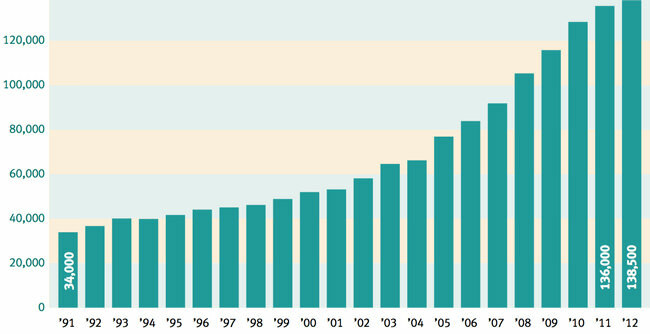 In total, foreign students made up 11.5% of the country’s higher education enrolment for the academic year. A majority of Bildungsausländer students come from Eastern (26.1%) and Western Europe (18.9%), with Asia and Africa also emerging as important sending regions as well. China alone accounted for 13% of Bildungsausländer enrolment in 2013/14 (28,381 students), with Russia (11,126), India (9,372), Austria (9,305), and Bulgaria (6,741) rounding out the top five source markets for the year. Just over a third (34.2%) of Bildungsausländer students were enrolled at the undergraduate level. Another 30.3% were studying Master’s degrees, and 11.1% in doctoral programmes (leaving just under a quarter classified as “other degrees” or non-degree study). The DAAD report for 2015 also focuses on two categories of outbound students: those who go abroad to pursue a complete degree programme and those who go for a short, study-related visit abroad. DAAD draws on the Erasmus data along with findings from three student surveys to determine that around a third of German graduates in 2009 and 2010 had completed at least one study-related visit abroad, with roughly a third of these being for three months or longer. This means that Germany has already met Europe’s 2020 target for outbound mobility (that 20% of graduates have some international experience), and is tracking well to more aggressive national targets (that a third of graduates study abroad for at least three months and that half have some study experience abroad). As the following chart reflects, the percentage of German graduates who have completed a study visit abroad has increased significantly over the past decade or so. The chart tracks participation by students from universities as well as from Fachhochschule (higher education institutions with a specific subject focus such as engineering or business). While the numbers trend slightly differently for the two types of institutions, the overall participation in study visits abroad rose from around 20% in 1991 to 30% in 2012. Beyond such short-term study visits, 138,500 German students pursued complete degree programmes abroad in 2012 (the latest year for which statistics are available). This amounts to 62 of every 1,000 higher education students in the country and compares to the 64 of every 1,000 who went abroad in 2010. As we noted late last year, the vast majority German students abroad remain in Western Europe. The major destinations within the region – the Netherlands, the UK, Switzerland, and Austria – collectively accounted for 61.5% of German higher education enrolment abroad in 2012. The US was the only non-European destination in the top five in 2012, and hosted 9,819 German students that year (7.1% of the total). This entry was posted in Europe, Germany, Higher Education, Regions, Research and tagged universities with international students, student enrolment, undergraduate admissions, undergraduate student recruitment, postgraduate student recruitment.